Illinois' Mark Candotti handles the puck during the game against Indiana University on Saturday. 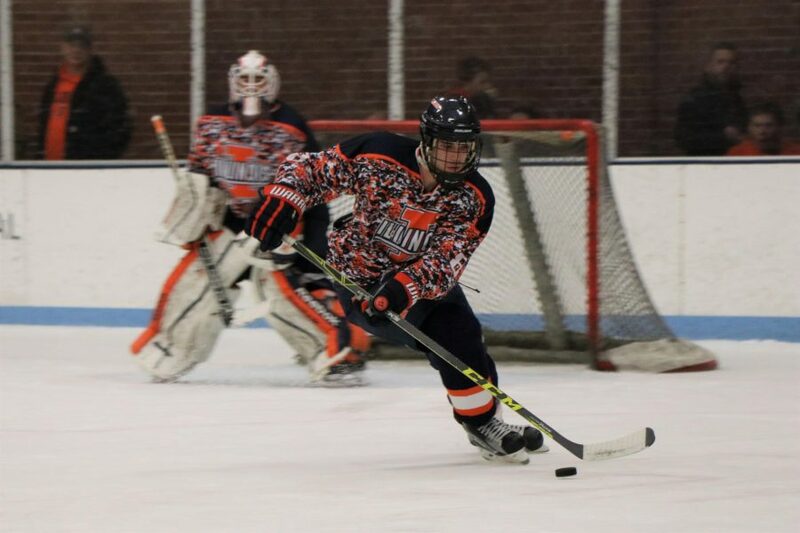 The Illini had three players with two-goal weekends as they cruised to two blowout victories. 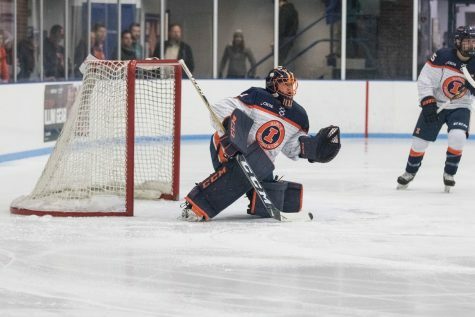 Key Player: Goalie David Heflin grabbed his eighth win of the season on Saturday. Up Next: Illinois is off until Ohio visits the Big Pond on Feb. 10. 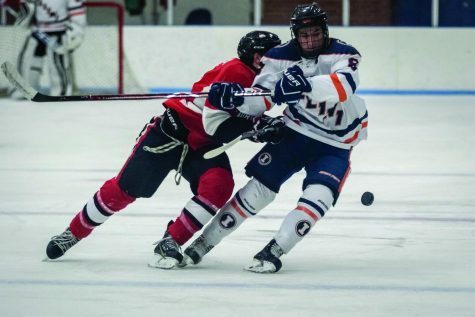 The Illinois hockey team was knocking its sticks against the boards and enjoying Tommy O’Brien’s moment before its game against Indiana on Friday. “And Tommy O’Brien is the head coach for your Illinois Fighting Illini,” PA announcer Larry Kimball announced over the Illinois Ice Arena’s speakers. 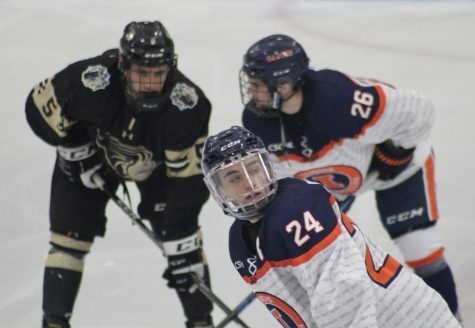 O’Brien, usually Illinois hockey’s assistant coach, got a taste of head coaching experience in the absence of head coach Nick Fabbrini last weekend. 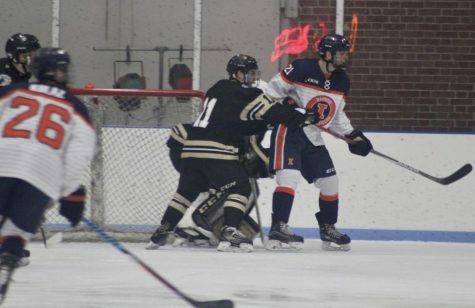 The Illini were short-handed without Fabbrini, forward James McGing, defenseman Tyler Opilka and goalie Joe Olen. The quartet is part of the Winter World University Games’ U.S. team. They are currently competing in Almaty, Kazakhstan, for the tournament. O’Brien had no prior head coaching experience, but he led the Illini to a pair of wins over the Division II Hoosiers. 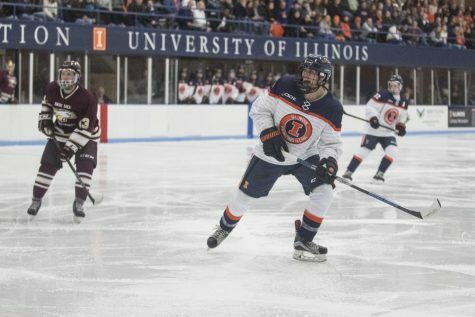 Illinois toppled Indiana 8-4 on Friday behind two-goal nights from forwards Grant Stueve and Chris Lozinak. Stueve said his teammates were doing a good job of setting him up for high-percentage shots. “The guys were just giving me the puck, and it just happens to be on my stick right in front of the slot, and I’ve been able to put it into the net,” Stueve said. Champaign-native and Indiana forward Trent Kunis sent a group of friends and family into roaring applause after a third-period score. The sophomore has seven goals this season. 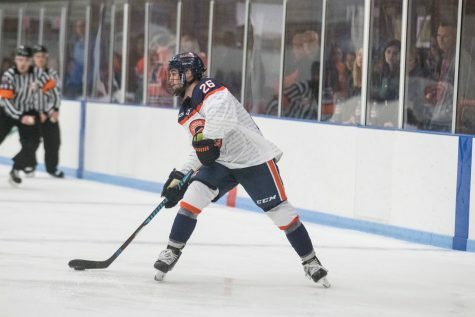 O’Brien tried to have fun with his role this weekend but still found himself frustrated with Illinois’ third period performance in the first game, which resulted in two allowed goals. 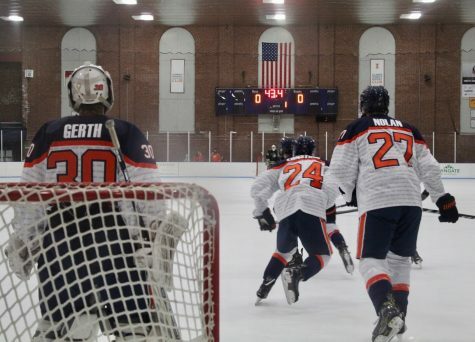 The Illini won handily on Saturday, 7-1. Top-line forward David Kellner scored two goals. Junior David Heflin got the nod in goal Saturday after senior Zev Grumet-Morris allowed four goals Friday night. Heflin improved to 8-1-1 this season and nearly had his third shutout. Heflin said his teammates made his job simple on Saturday. Heflin is considered the team’s backup, but he has made a case for why he should get late-season and playoff starts. He said it does not matter what role Fabbrini and O’Brien give him as the season comes to a close and Olen returns from the tournament. 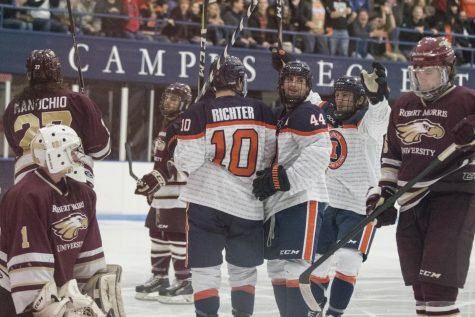 Illinois does not hit the ice again until CSCHL-rival Ohio visits the Ice Arena for a weekend series on Feb. 10-11. The Illini split an early season series on the road against the Bobcats. O’Brien will lose his interim head coaching tag as Fabbrini returns for the series. The trio of players will also be available to compete against Ohio. The interim coach still said he took pleasure in getting to coach the guys for a weekend.